A recently released environmental lifecycle comparison of Direct Metal Laser Sintering (DMLS) and rapid investment casting leaves little doubt that DMLS is the more sustainable manufacturing option. 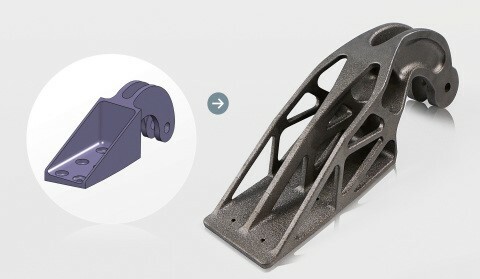 In the joint study between airplane manufacturer Airbus and metal 3D printer manufacturer EOS, a standard Airbus A320 nacelle hinge bracket underwent a rigorous eco-assessment. The study, which detailed the lifecycle of the hinge, from raw metal powder to end user, was undertaken to create a baseline for larger studies that will assess whether AM technology is a cost effective and sustainable technology for end-use aerospace parts. · The use phase has by far the biggest impact in terms of energy consumption and CO2 emissions over the whole lifecycle of the bracket. · CO2 emissions over the whole lifecycle of the nacelle hinges were reduced by nearly 40 percent via weight saving that resulted from an optimized geometry, which is enabled by the design freedom offered by the DMLS process and the use of titanium. · Most significantly, using DMLS to build the hinge may reduce the weight per plane by 10 kilograms, a noteworthy savings when looking at industry “buy-to-fly” ratios. · The total energy consumption for creating the initial raw powder metal, then producing the bracket in DMLS, was slightly smaller than the equivalent cast process steps (with the higher energy use of DMLS limited to the melt and chill cycle of its manufacturing profile and offset at the same time by a significantly reduced build time). Casting in this comparison was burdened with the furnace operation of burning an SLA (stereolithography) epoxy model, which uses considerable energy and generates greenhouse gases. · The DMLS process itself used only the material actually needed to make the part—thereby eliminating waste from secondary machining and reducing consumption of titanium by 25 percent over the cast application. Given the evidence it’s hard not to conclude that additive manufacturing should be on the mind of any manufacturer looking to produce high-quality, low run parts. If metal 3D printers can catch up to their casting counterparts in terms of speed and cost, AM might be the only solution for the future of sustainable manufacturing.